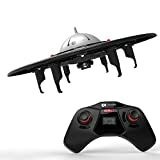 · Drone with THREE SPEED and easy maneuver design. Stylish, lightweight and durable - enough to survive a moderate impact against obstacles. Allows night flight, safety in the dark - thanks to built-in LED lights. · Up to 8 min flight, 50 meters range, 6 top blue LED decoration, 4 LEDs on base, flight indicators. · One return key: return button, intelligently and automatically regulates the return.